Can be a beautiful, elegant gift for all occasions. Aarsun woods promotes to you the handmade wooden service trolley / kitchen trolley made up of fine wood with fine finish.The service trolley /Kitchen Trolley serving cart has two levels where you can place your eatables and other items.There are case for placing bottles in this dessert cart.There is handle and wheels for moving the trolley / rolling bar cart. There are pillars over the food trolley / beverage cart which are fully carved by our artisans.There is wooden railing at the side of the wooden trolley. The wooden service trolley / Kitchen trolley has beautiful work at both the levels. 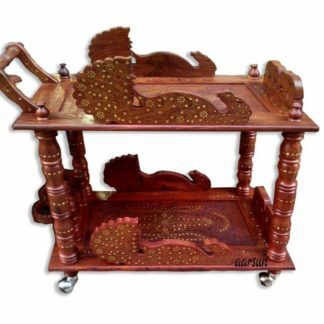 We use seasoned Sheesham wood in making trolley / serving cart and you can use it in your home and add more classy look to your home. Sheesham Wood (Indian Rosewood) is among the best quality woods and is extremely durable and long lasting. It is in reality decay resistant. 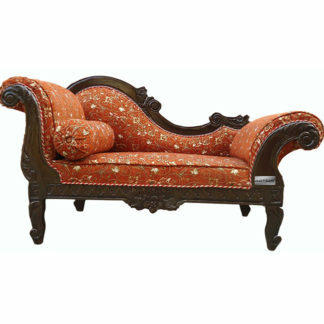 The feel of Sheesham is medium to coarse with a decent natural luster. Use a table artifact or any thick quality cloth to wipe it clean. To protect it from attenuation, avoid keeping the merchandise close to product near windows wherever it are often exposed to direct sunlight. Custom Sizes Available as per user Requirement. I’m satisfied with the table. Gives a great ethnic touch to the room. It was packed well. nice product, got more than i expected. The product is fabulous and worth the money. Though the delivery was a bit late but the quality of the product was amazing.